Our program is one of the largest guitar program around, and focuses on self-paced learning and developing a lifelong love of music. 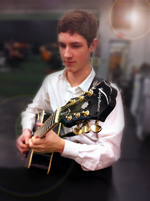 Students are taught skills in reading chord charts, tablature, notes and rhythmic patterns. Complementing these skills, these g uitarists will learn strumming patterns and picking patterns through the study of appropriate songs. 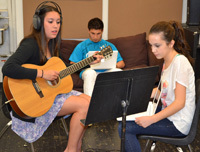 Students learn to write their own songs and have the opportunity to perform for the class individually or in small groups. Part of our mandate is to exposes to students to new forms of music that they may never have experienced before. From Bach to BTO, Led Zeppelin to latin and everything in between! Experienced Guitar players also have the opportunity to our Composition and Technology course which not only gives students the chance to learn guitar but also create and record their own songs in RoadSense Studios, our new recording space complete with multi-track recorders, editing workstations, professional drum kit and a full complement of microphones! Students are taught the basic skills necessary to perform on their from time to time. Students are also encouraged to participate in the annual spring field trip. Students may provide their own instruments and miscellaneous equipment. Some instruments/equipment will be available through the school without fee on a needs basis. Students using school instruments will be limited in choice of instrument. Those who choose to have their own instrument may “rent to own” or purchase an instrument through retail music stores. The school will help facilitate this.